Phrozo Particles 2 is a mod specifically for Sikkmod 1.2 for Doom 3. It includes particles from Phrozo Mod 2.0, as well as new particles, textures, and materials unique to this mod. There are no gameplay changes in this mod, only new particle effects. 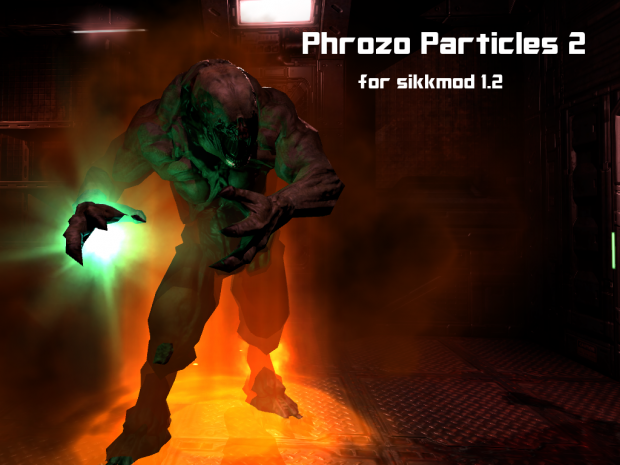 .Phrozo Particles 2 is a mod specifically for Sikkmod 1.2 for Doom 3. It includes particles from Phrozo Mod 2.0, as well as new particles, textures, and materials unique to this mod. Don't work. game crash on load mission. How fix this? If you want Phorozo, since you gave me permission tot use your particles, when I have free time and finished off my add on I can make your particles compatible 90% with sikkmod WITHOUT overwriting sikkmods particles, sikkmod has some neat particles but with the addition of your particles merged together, it'll look even better. Since I learned how to edit particles (not a master) I can further improve your particles without them losing their originality as well. Big fan of your work. After few hours I actually got perfecteds and your particles to work togehgor instead of using 1 or the other/overwriting. I then also further tweaked them to look even better by increasing the smoke and particles and sparks.